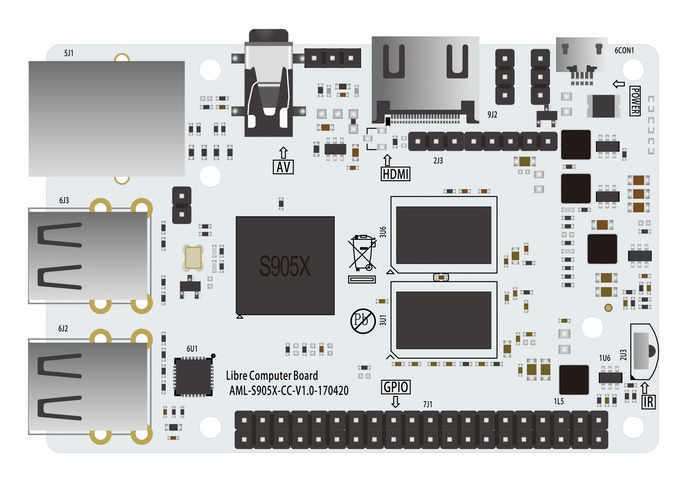 Libre Computer have this week launched a new piece of hardware via Kickstarter which takes the form of a next-generation 4K Ultra HD SBC development board which has been specifically designed for makers and offers a similar form factor to the Raspberry Pi mini PC. The Libre Computer Board is fitted with a Quad-Core 64-bit processor which is supported by 2 GB of RAM and is capable of running a number of different operating systems including Android 7.1, Linux 4.9 LTS and Mainline. The first Libre Computer Board, code name Le Potato, is a fast low power single board computer about the size of a credit card utilizing the latest technologies and designed for professionals, enthusiasts, and hobbyists. It is capable of running the latest Linux distributions and Android operating systems while supporting 4K Ultra HD with HDR via HDMI 2.0. It can be used to tinker with electronics, teach programming, build media centers, create digital signage solutions, play retro games, establish bi-directional video, and much more. It utilizes an existing ecosystem of technologies and components to enable creators to build new fun and innovative products and services at lower cost. Le Potato is powered by quad 64-bit ARM Cortex-A53 CPU cores along with a ARM Mali-450 GPU with 2 geometry and 3 pixel cores. The display engine can output 10-bit 4K 60FPS and accelerate decoding of all of the latest media standards such as the H.265 HEVC and Google’s VP9 codecs. It comes in both 1GB and 2GB configurations and will have Linux 4.9 and Android Nougat 7.1 images.